Product prices and availability are accurate as of 2019-04-23 10:38:36 UTC and are subject to change. Any price and availability information displayed on http://www.amazon.com/ at the time of purchase will apply to the purchase of this product. WOLF FACTS: The gray wolf, also known as the timber wolf and the western wolf, is the largest wolf species on the planet. Famous for traveling in packs, each group has an alpha male and female. When a wolf wants to communicate with its pack or other packs, they let out a piercing howl. CHARACTERISTICS: Hand painted and crafted with stunning realism, this figurine would fit in perfectly in the forests and plains of Eurasia or North America. This wolf is trying to get the attention of its pack with a mighty howl! MADE WITH INDUSTRY-LEADING STANDARDS: All Safari Ltd. figurines have been individually hand painted with careful detail. They feature quality construction from BPA, phthalate, and lead-free materials to ensure your family's safety. PUMP UP YOUR PARTY: There's a Safari figurine for everyone in every size. They make excellent craft projects like card holders and ornaments. For parties, you can use them for favors, cake toppers, or decorations. Plus, their realistic design makes them an accurate representation for dioramas and school projects. Let your imagination and creative side run wild with Safari Ltd. 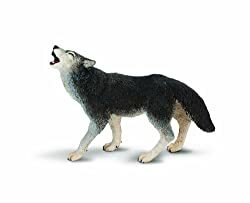 PRODUCT SPECIFICATIONS: Package contains (1) Safari Ltd. North American Wildlife Collection Gray Wolf Realistic Hand Painted Toy Figurine Model made with quality construction, and without using Phthalate, Lead or BPA Materials. Measures 3.78"L x 1.13"W x 2.77"H. Recommended for children ages 3 and up.